GROUND ZERO PLUS 1258 DAY--New York, NY, Saturday, February 19, 2005--War is all about Terrorism at its worst. Men and women kill each other with indiscriminate violence, and, in the aftermath, count the bodies to claim victory. In some cases, battles find their way into the pages of history as symbols of the courage and bravery of the warriors who fight them. Usually, such accolades are dictated by the victor since the history pages usually belong to the printing presses of the victorious. Such is the case of the battle of Iwo Jima, one of the fiercest ever fought during World War II. On this day, February 19, 2005, it hallmarks the 60th anniversary of the U.S. Marines storming ashore on the island of Iwo Jima. Seven thousand of the 50,000 U.S. Marines taking part in the battle died during this engagement; more than 20,000 Japanese defenders were killed. Over thirty-six days of fighting in volcanic ash, U.S. Marines and Japanese soldiers clashed in bitter hand-to-hand combat as Marines struggled to raise the U.S. flag atop Mount Suribachi. Today, a monument to that flag raising sits in Washington D.C. with the slogan: "Uncommon Valor Was A Common Virtue." Twenty-seven Congressional Medal of Honors were awarded to U.S. troops during the battle; twenty-two to U.S. Marines and five to U.S. Navy Corpsmen. 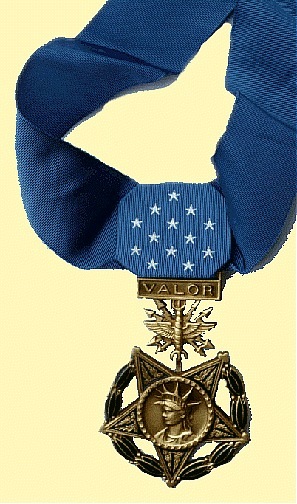 (see list below) The Medal of Honor is the highest award of bravery granted by the United States. It was introduced into Congress on December 9, 1861 as a bill to honor two-hundred brave navy personnel. Another bill in 1862 included the army. "The Medal of Honor is awarded in the name of Congress to a member of the navy or military who distinguishes himself or herself by conspicuous gallantry and intrepidity in the line of duty. The deed performed must have been one of personal bravery or self-sacrifice so conspicuous as to clearly distinguish the individual from his or her comrades and must have involved the risk of life. Incontestable proof of the act is necessary and each recommendation for the award is considered on the standard of extraordinary merit. "The Congressional Medal of Honor is a symbol of those high ideals. It is this nation's expression of gratitude and recognition to those individuals whose uncommon valor sets them apart from other men or women." The key statement in the Medal of Honor citation is the phrase: "When they could have done less without blame or dishonor, they gave more, responding 'above and beyond the call of duty.'" In many ways, the U.S. Medal of Honor is a Medal of Vigilance. Vigilance is not about doing the ordinary, but exercising the extraordinary. It is about self-forgetting, about doing what is right for the safety and security of others with disregard for personal safety or security. Anyone who knows the history of Iwo Jima understands the Japanese were of equal bravery and conviction. The 20,000 Japanese defenders of Iwo Jima were under the command of General Kuribayashi. He had gone to school in the United States and told his superiors that Japan could not win a war against the United States because of the nation's unlimited resources and its will to fight. 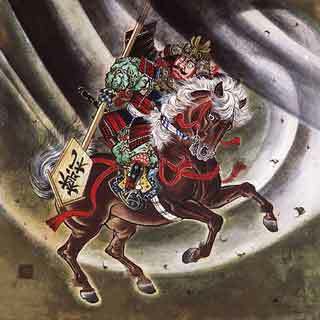 But General Kuribayashi was cut from the samurai cloth, and in that tradition, one fought with honor to the death. He passed the word to his men that no one was to surrender, and that the goal was for each Japanese soldier to kill at least ten Marines before dying, for under the samurai code, there was no dishonor in death, only in surrender. In keeping with this pledge, of the 20,703 recorded dead Japanese at the end of the battle on March 26, 1945, only 216 had been taken prisoner. Knowing the resolve of the U.S. to use incredible forces to acquire the island for its strategic airfields, General Kuribayashi carved deep caves into the innards of the island, allowing the Japanese to sustain six days of intense American artillery shelling prior to the invasion without a scratch. The underground cave complex was so articulate it included a major hospital, electricity, and all the elements of subterranean living. Americans were forced to attack the Japanese in the caves, using flame throwers and explosive charges to collapse the structures. Little did the warriors know that in six months, on August 6, 1945, a bomb equaling the measure of 20,000 tons of TNT, one ton for each of the dead Japanese on Iwo Jima, would be dropped on the city of Hiroshima, ushering the end of World War II and the launching of ironic state of peace and prosperity between East and West. I sit back on a day like this and think not so much about who won what on that particular day, but rather I reflect upon the heroism of individuals during death-defying acts such as only war creates. I am without doubt that the Japanese soldiers had more than their fair share of soldiers who deserved their "Medal of Honor," but there was no one left to attest to their bravery. Personally, I fought with a man who earned the highest bravery award America has to offer. He was not a sword-wielding warrior who killed countless enemy on his way to rallying the troops. His sword was a cross of peace, a crucifix to be exact. Unarmed with conventional weapons, my dear friend Father Vincent Capodonno, was a Navy Chaplain who went into the field constantly with our Marine units and crawled through the thick of battle administering spiritual aid to the wounded and dying. He would pray over us daily for our safety and was fearless in regards to his own life when it came to slaving the wounds of others. He was killed administering aid to wounded Marines. Despite being repeatedly shot, he continued to drag wounded Marines to safety until he was finally cut down. A monument to him stands on Staten Island in New York City, and I visit it on occasion to remind myself that heroism in battle is not just about the killing of others, but about the bravery of self-sacrifice for others. This is what being a Sentinel of Vigilance is ultimately all about. I think about Vigilance as I do about an unarmed warrior such as Father Capodonno, or any of the Navy medics who won the Medal of Honor on Iwo Jima, or any of the Japanese corpsmen or their spiritual advisors who, unarmed, risked life and limb to protect the wounded and crippled. The Japanese have their equal to the Medal of Honor. It was the Order of the Golden Kite . They also offered the mothers and fathers of those who died for the Emperor a bereavement medal. War, ultimately, is not about killing. For the student of conflict, war is about the bravery of those who are willing to die for others. In the quest to understand the importance of Vigilance, a parent needs simply to ask: "To what length would I go to protect the safety of my family?" For the most part, few parents would hesitate to risk life and limb to save his or her child from harm's way. Dashing into a burning house to save a child; jumping into the street to whisk a child away from an oncoming car; facing a bully parent or adult who threatens a child--all seem natural and normal responses of a parent to brave any obstacle that threatens one's children. But what about the threat of "Inner Terrorism?" Unfortunately, not many parents think much about the war going on in a child's mind regarding the child's worth, or his or her place in the scheme of things. A child's Fears, Intimidations and Complacencies are usually hidden, much as the Japanese troops were in Iwo Jima, in deeply dug caves of the human mind. Human emotions tend to be subterranean at best, and only when trust and confidence reach a certain level do they rise to the surface and feel safe to sniff the air. 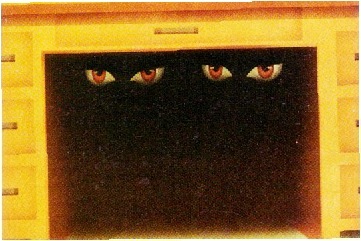 Unless a parent understands that his or her child harbors "fears of invasion" and thinks back to his or her own childhood when the parent often hid inside the labyrinth of the mind, fearful and hesitate to share the deepest of secrets with his or her parents, the child may be lost to the Beast of Cave Terror. But, if a parent truly thinks about the role of being a Sentinel of Vigilance, then sharing with a child his or her own levels of Fear, Intimidation and Complacency serve not as a sign of weakness, but of a way to communicate and touch the child's latent Terrorisms. Once the Fear, Intimidation and Complacency are brought to the surface, the odds are that Courage, Conviction and Right Actions for future generations will take command. 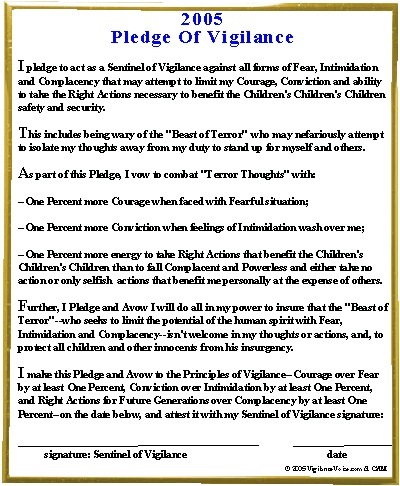 These last items--Courage, Conviction and Right Actions for future generations--are the Medals of Honor that a parent earns when he or she fearlessly enters the caves of a child's mind. There is a great risk the child will push the parent away at first, only to test the commitment of the parent to stick to his or her guns. After a while, if a parent is honest with a child from the inside out, the child will soon share the fears within. Then, both parent and child have become Vigilant. Both have become heroes. So on Iwo Jima day, there are many lessons to be learned. One is that we need not go to war with our enemies. We need, instead, to bridge the gap between the differences. Vigilance is about standing up to the Beast of Terror so the Beast knows we are not afraid of him, and that our bravery and courage stems not from our own need for personal conquest, but rather flows from the need to protect and insure the safety of our children and loved ones. 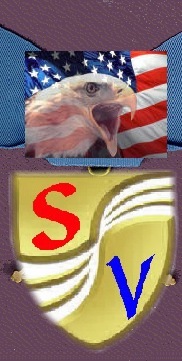 So give yourself a Vigilance Medal of Honor.